There are many reasons that your teenage daughter might want a horse. There’s also many reasons that as a parent, you may think it’s a bad idea. There’s pros and cons to every situation, I know. Cons: first off, horses are expensive– they’re actually black holes for money, let’s be realistic. This is usually the first turn off for parents. They take countless hours and coordination of chauffeuring your daughter back and forth from the barn. There’s plenty of other cons, for sure. But for argument’s sake, let’s try to put all those hesitations on hold for the next 5 minutes…. And go! As an on again, off again riding instructor, I believe that for all of the challenges, there’s far more benefits, many that you may not even know about yet. 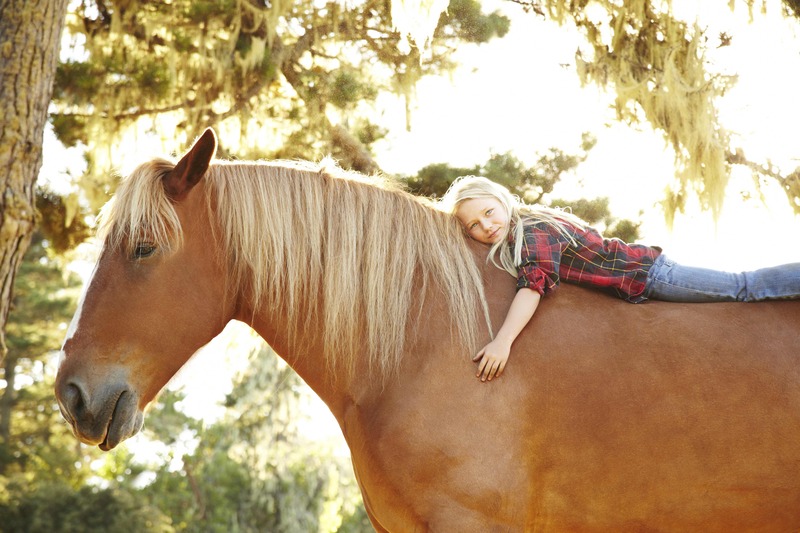 A horse could mold your daughter into the person you’d be proud to see her grow into. To all of the parents who are weighing the pros and cons of horse ownership, here’s why I would argue that it’s worth every penny. 1. It keeps her out of trouble. Let me say this again. IT KEEPS HER OUT OF TROUBLE. When she’s busy at the barn riding (… and grooming, and cleaning tack, and cleaning stalls and doing turnout and dumping wheelbarrows and raking the arena and so on) she has less time to get into trouble. Boredom and friends who may be a bad influence get pushed to the side line, because frankly, getting a job to pay for that new saddle is more important. This is the same with any intensive sports program. Some may argue that horses take up too much time for kids, but I disagree– as long as it’s not all work and there is some play in there, their days may be full but they’re fulfilling. 2. It costs money– which she should be at least partially responsible for. Horses do cost a lot of money. So does their tack and vet bills. And the board bill, if you choose to board at a stable. If you’re willing to help your daughter in some financial way I’m sure it will be greatly appreciated. But in no way should any parent be expected to front all of that bill. Figure out a system to split up the costs that works for both of you. If she wants a horse, she should be expected to get a job to help pay for it. End of story. Plus, that job will help keep her out of even more trouble. Just like any pet, this horse depends on her for exercise. It depends on her skill and patience to learn new things and uphold good manners. It depends on her time and her money to eat, to drink, and to have shelter. In essence, this horse depends on your daughter (and you, out of default) for everything. This kind of dependence builds a lot of responsibility and character in your little girl, as long as she follows through on her end of the deal to take care of them. 4. It builds self confidence. Everyone says this, because it’s true. Most riding is an independent sport (she does it alone, versus on a team). However, she’s not really alone… She’s in a partnership, where she is expected to be the leader. And she’ll have coaches teaching her how to lead in the most effective way. Nothing builds self confidence better than “leadership training” that she loves. 5. It will help her meet new friends. If she’s in a lesson program, it’s likely that she’s going to meet many friends her own age. Most horse people will attest to meeting their best, life-long friends at the barn. That’s because friends at her school will only get to know half of her life. Her horse friends will get to know all of her, including the after-school horse loving, hard-working side that the others won’t see. Best of all, these girls will have the same passion and devotion in them too. That connection creates a stronger bond just in itself. 6. The barn offers a good variety of role models of many ages. Having a horse boarded at a barn offers a daily interaction for your daughter with people of all ages. When you drop her off, she will have the opportunity to freely connect with other women, without feeling the pressure of mom or dad standing by. Instead of just interacting with one age group in school or in sports, your daughter will talk many women in their 20s, 30s, 40s and 50s. If they get close enough, they’ll start to seek support from these women, which is key– they’ll normally offer the same advise you might want to as a parent, and your daughter may be more apt to listen to someone outside of the family. Better than getting advise from her friends at school? Maybe so. Many girls end up acting “more mature for their age” because of this daily influence. 7. It keeps her humble. Horses are going to teach her that she’s wrong all the time. She didn’t ride that move quite right, her legs slipped back and that’s why she fell off. Nobody else made her fall off but herself (and no, it’s never the horses fault). Or, her instructor is telling her (again) that her hands need to be quieter. That she’s getting there, but she hasn’t got it yet. 8. It’ll keep her fit and physically active. Horses, like most sports, will keep your daughter active. Riding, tacking up and untacking all are activities that require her to be moving around and outside in all kinds of weather (even if she rides in an indoor arena, you get the gist). Cleaning stalls, doing turnout, feeding– all of these barn chores actively burn calories and build muscle. Think kids are too sedentary these days? Get em’ a horse. 9. It helps them be creative, active teachers. Having her own horse means that for the most part she’ll be riding on her own, outside of a lesson situation. This means that she’ll have to work through a lot of the daily training challenges that come up when riding on her own. It will force her to think creatively about how she’s training her horse and how to solve a particular problem. 10. It teaches her HOW her brain learns new things. Me, I learn through metaphors. I also need to understand a big picture first before breaking it down into smaller details. I learned that through riding. At the end of the day, you’ll have to work as a family to decide if a horse is really the right fit. But I know from experience, horses help girls grow into empathic, engaged, and responsible young women. You make the final call. I am thirteen and I took classes last year and I advanced so fast. I have been wanting a horse for a long time and my parents won’t even think about it because they think that it is just to much money. I babysit and make money. Even though my mom thinks that I am responsible, she won’t even think about getting me a horse because it’s to much money, but I would obviously help pay for it and take care of it. I made a plan with my friend that we were going to get horses and we had everything a horse needed and she just immediately said no. How do you know when you are ready for a horse? Also, what do you think I should try and do to convince my parents? I was in this situation a year ago and know how frustrating it can be but don’t lose hope! If you have anywhere in your area that you could visit horses do that, not only does it show your interest to your parents you get to spend time around horses! Without being asked by your parents try to find tasks and chores you can do that could possibly be related to the responsibility’s of having a horse. Start saving your pennies, I found it really opened my parents eyes when I started saving my money even though I wasn’t allowed a horse(I’m a big spender and have troubles saving money XD). I started looking at horses for sale showing my parents what was out there even though they weren’t all that impressed. I also contacted a local horse lady who talked to both me and my parents let us know a little bit more about possibly getting a horse. Not sure how many classes you attended but I would recommend doing more, there great! I did two summers in a row of horse camp and two months of weekly one on one lessons before getting my horse and now I do a lesson monthly. Lessons will build up both skill and confidence! You don’t want to get on a horse alone and have something happen you didn’t know how to deal with, it could possibly scare you and ruin your riding, best to just be safe with lessons! Even the best of horses will act up and you should know how to deal with a misbehaving horse and be confident enough to do so. Your instructor should be able to tell you when they think your ready for a horse of your own. i am turning 13 soon and have always wanted a horse! mum has finally said i can start proper lessons (know the basics already…) when would be a good time to bring up leasing/buying a horse? I have taken classes and my mom keeps saying that I should get a horse at 27. I think you should ask when you know more, like the body parts, how to jump, and know what to do with a horse. Also have a backup plan just in case they don’t agree with something. Try to find a horse near you. Also need help with the maintenance of the horse. I was with someone who’s horse kept having hoof problems. The area we are in is very wet and muddy most of the time which causes alot of hoof problems. I had to go every day and clean and disinfect her horses foot and bandage and wrap the one foot for months due to wet, muddy conditions and don’t want to have her horse go through the same thing. Any suggestions for wet muddy pasture? I’ve been riding for five years, and many of the riders at my barn have horses by now. There is even one person who has been riding for two years and just bought a mare. I would love a Horse, but I’m too young to get a paying job, and my parents can’t pay for everything, so it’s just not in the cards right now. But, I now lease a pony. I feed him, give him New shavings, exercise him even if I don’t ride, and not to mention, I’m at the barn a lot more than some of the people who own their own horses. So, I think leasing a good alternative for those who can’t afford a horse. My daughter is 10 yrs old and has been through a month of horse camp the last two years. She is positive and very excited as her mother and grandmother just set up a pasture and bought her a 1/4 horse/ pony cross that is well trained and completely ready for her to take on the responsibility. She’s a little nervous about it, as I can tell but positive and very independent and head strong for her age. I’ve been around horses trained and aggressive but want to help her take on the responsibility. Just looking for some training skills for her and anything that will help? Any suggestions? Hi I’m Lauren and I’m almost thirteen. I want a horse SO BAD but I’m not sure if I’m ready for one. How do i know if I’m ready to own a horse? I suggest riding lessons, they’re fun and very helpful! Your instructor should be able to tell you when your ready. Also lots and lots of research!